In the "Lytell Geste of Robyn Hode" the earliest surviving ballad about Robin Hood, the prioress is referred to as "The Pryoresse of Kyrkely". The assumption has been made that this priory of 'Kyrkly' was at Kirklees in West Yorkshire. However, there is now good evidence to indicate that this assumption is incorrect. 'Kirkly' was no more a reference to Kirkless as 'Lochesley' was to Loxley. John de Savile who purchased Kirklees estate from Pilkington [and therein lies a tale in itself] being appointed sheriff of Yorkshire in the early 1600's had an interest in the office of the sheriff and undoubtedly read the Robin Hood ballads, falsely concluding that Robyn was buried at Kirklees. In his conviction, he had constructed, a grave cover, which he placed on the highest vantage point of the estate, overlooking Calderdale. Savile's belief that his estate contained the body of the 'outlaw' has never been verified by any primary means whatsoever. From this assumption has descended a myriad of impossible constructions designed to prove a false hypothesis. A more correct interpretation is that the suspected author Stephen II Le Waleys was buried at the priory of Healaugh near Tadcaster by his own desire as given in his will and that another person added the last few verses in the Geste after his death in 1347. 'Kyrkly' merely referring to the church fields. When much of what is in the Geste is so cryptic, it would, unless it was a large well-known town or city, be highly unlikely to have a distinct place-name which can be geographically identified. Kirklees Priory existed in the early 1300's within the western division of the Wakefield Manor . Various names of Prioresses have been suggested as the inspiration, but according to Joseph Hunter she may have been Elizabeth de Staynton1. By 1348 Margaret de Savile* was known to be the acting Prioress and Ralph Thoresby3 records that she was the prioress here at Kirklees in 1350 and 1359. These years partly encompass the Elland Feud culminating in Sir John Eland's murder at Lane Head, Brookfoot in 1353 while riding to a tourn at Brighouse. Although the Saville and Eland genealogies are poorly understood, it appears that Margaret de Savile was the sister of John de Savile [d. 1353] who married Isabel de Eland. Sir John Eland also Warenne's steward and lord of the manor of Brighouse and High Sheriff of Yorkshire in 1341 was the brother-in-law to Sir John de Savile through his sister Isobel de Eland. *Margaret Savila, sister of Sir John de Savile of Thornhill [d. 1405] who married Isabel de Eland, the grand-daughter of Sir John de Eland the rapacious High Steward of the Wakefield manor and High Sheriff of Yorkshire murdered by assailants in 1353 with his son John who were embroiled in what came to be known as the 'Elland Feud'. The demise of Robyn Hode in the Geste appears to be intertwined with the murderous dispossessions of the Elland Feud which to a number of commentators, appears to be partly fiction and partly fact, much like the Geste. Certainly if Margaret de Savile was the prioress in waiting in 1347, she may well have had a hand in the death of the outlaw through her influence upon the prioress of Kirklees and through her kith, one time Sheriff and all-round dastardly person, Sir John de Eland. The hunt for the prioress might start with Margaret de Savile, whether in fiction or in reality. J.W. Walker noted Alice de Scriven was a prioress of Kirklees from 1307 until 1328, after which year Walker states that there is no record of any prioress until 1359 when Margaret de Savile is mentioned. The tenure of Elizabeth de Stainton appears very tenuous. Dodsworth and Dugdale's Monasticon merely state that Elizabeth de Staynton was prioress in the '13th century'. The chances are that Margaret de Savile was the superior in 1347 but her inclusion if she were the model for the prioress in the Geste appears to be more symbolic than actual..
Elizabeth's de Staynton's remains lie in what is called the "Nun's Grave" which supposedly includes others [two sisters13], which was discovered in 17061. Camden's first edition of Brtiannia in 1607 did not have an illustration of the grave slab for an obvious reason but the 1789 revised edition showed a flat stone with a raised buttony cross. This is translated as: "Sweet Jesus of Nazareth, son of God have mercy on Elizabeth Stainton, prioress of this house"
The priory or "Nunnery" had a priory church, recorded by Hunter. About 18 yards from the east end of this priory, Hunter recorded Elizabeth de Staynton's gravestone constructed in the form of a Lombardic cross probably dating from the 1300's. This Lombardic cross called a bottony cross or perhaps a crosslet in heraldry may be the same incorporated into the Armytage Arms and is still found in their Arms today12. This grave site was bricked and railed in the 1800's by George Armytage in the same style as that of the "Robin Hood" grave on the nearby ridge. Elizabeth's grave now resides in Lady Armytage's back garden6. It is important to notice that there is no death or burial date given on the gravestone and thus this has led to much debate and "listing" to either confirm or deny that Elizabeth de Staynton was the "murderess" or the "careless nurse"of the "Geste". Hunter attempted to show as described in the "Geste" that Robin Hood and a prioress were related. Hunter concluded that this Elizabeth de Stainton, was the relative of Robin Hood who bled him. Some have suggested that the form of the cross [Lombardic] on Elizabeth's grave as found on a similar one to that supposedly of Robin Hood's at Loxley [Warwickshire, not South Yorkshire] is that of the Knights Templar. These knights were hounded by king Phillip of France, a proclaimation was issued by the Pope and Edward the II in 1308 was reluctantly complied with his father-in-law to strip these knights of their properties, which were granted to various lords and later to the Knights Hospitallers. Lists of prioresses for Kirklees priory. 10. Joan Kepast, the last prioress of Kirklees, house surrendered November 24th 1530. She was buried at Mirfield church where her name is entered in the registry. 1155? Elizabeth de Staynton - as the first prioress. 1240 Sybil [Sibill] -The murderess if the "Robin Hood" grave date of 1247 and John Major's work are used. 1344 Mary Startin -The Prioress if Hunter and Baine's works are used. Mary could have died of the "Great Pestilence" in 1348-916. A prioress is noted to have died in 135017. 1350 Margaret de Seyvill [Savile]- daughter of Sir John Savile who married into the Thornhill estates of Thornhill. her brother. [Kirklees held land at Emley]. 1491 Johanna Stansfeld [Joan Stansfield]- from the well known Stansfield family of Heptonstall. The last prioress of Kirklees, Joan Kepast may have been the daughter of a Thomas Kyppes. Sir Robert Kyppes [Keppax, Kippax, Kepas] [1490-1513] her brother, was sometime chaplain of Kirklees and later vicar of Mirfield. Joan was buried Mirfield 5th February 1562. Sibil or Sigil 1240- The murderess if the 1247 grave date is used. Elizabeth de Staynton- period of office uncertain. Joan Kyppes or Keppax 1539. If anything, the lists are inconclusive as far as Hunter's death date of 1347 goes. From three of the lists it might be concluded that Hunter could have assumed that the prioress, who is reputed to have bled Robin Hood in the "Geste" was the first prioress of Kirklees but from the lists Mary Startin looks a better choice, she apparently died in 1348 from the "Great Pestilence"16 However we could consider that Margaret de Savile was the acting prioress in 1347. From the "Geste" it would appear that Robin Hood and the Prioress, whoever she was, were related. In Munday's Downfall of Robert Earle of Huntington and the Death of Robert Earle of Huntington, Gilbert de Hood is described as being Robert Earle of Huntington's uncle and held the position of Prior of York. If it could be shown that there was a prior of York by the name of de Hood then it might raise questions about the role of the church in Robert of Huntington's death. The titled nobility had strong links with the church hierarchy, for their own families were often in positions of ecclesiastical power and influence. Cecilia Topcliffe aged 60, Isabella Hopton aged 50, Agnes Brook aged 50, Joan Leverthorpe aged 60, Isabella Rhodes aged 40, Katherine Grice aged 25 and Isabella Saltynstall aged 24. Those shown in bold type took up residence in Mirfield in a house later known as Papist or Paper Mill, now demolished. The other three may have taken over the running of the tavern, afterwards called "The Three Nuns". The prioress and nuns were given pensions. The Lytell Geste of Robyn Hode was probably written about 1489, this is half a century before the dissolution of the priory in 1539 and indicates that the tradition was accepted around Kirklees and spread by the ballad to many other parts of England. According to the "Geste", Robyn Hode repaired to a nunnery, Kyrkly, from where it was claimed he shot his arrow from one of the two rooms in the upper part of the priory Gate House. The point at which the arrow landed marked the site of his final chosen resting place. The prioress is supposed to have hastened his demise by blood letting . Robin Hood is calculated by Hunter & Baines to have died in 1347 at the age of 77, based upon the gravestone at Kirklees, the year Elizabeth de Staynton may have been removed from office [others say he died aged 57.] We might note that this would make Robyn's birth about 1270 . There is absolutely no evidence that the Robert Hood of the Wakefield Court Rolls was the same person as that supposedly buried at Kirklees or the he "Contrariant" of Hunter. Hunter calculated his death date for Robyn from the time since a Robyn left Edward II's service. Is it partial coincidence or a transcription error that the "gravestone of Robin Hood" was inscribed with the date 1247 not 1347, very probably by an over zealous Armytage? Did the prioress die of natural causes? Was she removed from office by the Bishop of York or did she commit suicide?2. Perhaps like a third of the population in the mid 1300's, this person died of the 'pestilence', the Black Death. Further relationships by J.W. Walker, Wakefield historian. There is also a reference to a John de Stainton who married Joan [?Notton], their child being Joan de Stainton. This Joan married John de Dronsfield. This Joan de Stainton may have been Elizabeth de Stainton's sister. John and Joan had three children, Agnes, who married John Wentworth of North Elmshall, Isabel who married John Bosvile of New Hall, Ardsley and [Sir] William Dronsfield. On William's death [dsp] it is interesting to note that his estates were divided between the Bosviles [of Ardsley] and the Wentworths [of North Elmshall], i.e. his sister's families for in a document from Woolley Hall we have a reference to Elizabeth de Staynton's admission from the priors of Bretton Priory to Kirklees Priory [J.W. Walker]. This was the beginning of a long line of Wentworths' at Woolley Hall. A Matilda Hood [nee de Toothill?] perhaps Elizabeth's step sister, perhaps daughter of Hugh de Toothill in the Wakefield Manor Rolls in 1314 was fined for collecting firewood for the manor estate. This Matilda may have married Robertus Hood of Wakefield. However much of this appears to be circumstantial and assumed, Walker could have been drawing a long bow. There is no proved nexus between Matila Hood and Matilda Toothill. For this reason some doubt has been cast upon the reliability of Walker's findings by later researchers. Elizabeth's lover was described in the "Geste" as Sir Roger of Doncastre. This would have brought her under the scrutiny of the Church hierarchy, but such "licentiousness" was often tolerated. At another de Warenne estate priory [at Castle Acre in Norfolk] established in 1090 by William 2nd Earl Warrrene for Cluniac monks, there were also reports of a series of scandals in the 1300's which suggested laxity on the part of the incumbents. However as always, nothing is so simple as a complication. John Major concluded that Robyn's death occurred on the 24th December 1247, which is the date given on the false gravestone at Kirklees. However, it is believed that much of John Major's 'evidence' is of the red-herring variety. Major's date is exactly 100 years before Hunter's calculated date [mentioned in the "Geste" as the 22 years spent in Barnsdale since leaving the king's employ for which in "real life" there is an account record]. Near his death, Robyn reputedly blew three blasts on his horn to summon Little John and then supposedly shot an arrow from his death-bed, in the priory Gate House asking to be buried where the arrow fell - 580 yards away! [in reality good archers could project an arrow perhaps 200 paces others claim a maximum of 200 yards. See Battle of Crecy] Thus it is more likely if this legend is to be believed, the original grave would have to have been closer to the priory. It may have been removed later to its present position on the ridge or more likely erected there primarily to commemorate the death of the man who was supposedly buried at Kirklees. The style of the lettering and the abyssmal phonetic spelling has cast doubt on the date of the inscription. The fact Gale vitrually hid the piece of paper upon which this record appears indicates that he himself did not put much store by it. Excavations failed to reveal any signs of interment. There is circumstantial evidence that the Armitage family, probably Sir John the Yorkshire sheriff, had the inscription made. His death was caused by letting Blood. The ballads never claimed Robyn was the earl of Huntington. This tag did not appear widely until 1598 in Anthony Munday's The Downfall of Robert, Earl of Huntington. Thus the inscription would appear to be post 1600, the year 1247 probably taken from John Major's work11. This date does not agree with that of Joseph Hunter's of 1347, exactly one hundred years later. 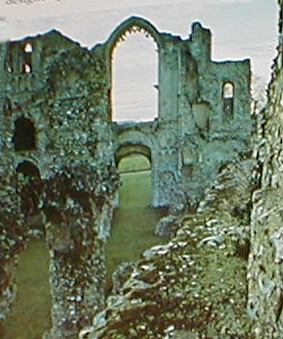 The Priory buildings consisted of a Gate House [still extant], church, cloister, refectory and a dormitory. The present stone farm buildings may be from these times. The foundations of the main buildings were revealed under the guidance of Sir George Armytage in 1902. He concluded in 1908 that the priory buildings or parts of them had been used as a residence and the stonework was then removed to build Kirklees Hall about 1610 which by 1983 had been relinquished and converted into luxury units. There was a priory garden [a garden wall is still evident] and the surrounding fields were tended for both crops and cattle [the latter evidenced by disputes with neighbours]. No doubt there would be a dovecote, orchard and cattle for milk. The Gate House was separate from the ecclesiastic buildings and would be used for non-church visitors. There is dispute as to whether the Gate House here is part f the old priory, certainly the upper structure looks later although this could be built upon earlier foundations. Roger Dodsworth a historian from the 1600's states that Robyn came to "Clifton on Calder" and suggests he may have made the aquaintance of "Little John", such hearsay was most likely gleaned from the local folk tales of the public house variety. That a person by the name of Robin Hood did die and was buried here, Baines is convinced [providing no evidence] but he correctly contested the notion that the inscription and date on the grave cover of 1247 were at all genuine4. 1. 1347 appears to be a better death date than 1247 for "Robyn Hode" or the suspected author of the Geste. 2. There does appear to be a family relationship between "Elizabeth de Staynton" and "Robert Hood" of the Wakefield Court Rolls but this is a deflection from the correct alignment. 3. There may well be a person referred to as "Robert Hode" buried somewhere in the grounds of the Kirklees estate but there is no absolute evidence for this nor is there any evidence that such a person could be the ballad outlaw. 4. There appears to have been a prioress named Elizabeth de Staynton buried on the same estate but her exact period of tenure is not yet known. 5. There are other contenders for the title "Robin Hood" in the north of England. i)The "Great Pestilence" of 1348-9 which killed 1/3-1/2 of the population in some districts may have led to the death of many ecclesiastics [who attended burials], the very young, the old and the sick, not the least of whom could have been some of the aforesaid characters. ii) The Elland Feud involving the local nobility. 7. There is a tangible if tenuous link between the Shire-Reeve's agenda and Margaret de Savile, the "prioress in waiting". The difficulty that arises is in resolving the conflicts presented between the narrative of the Geste and possible historical links and other traces of the legend. Further archaeological excavations and historical references may be required to determine more than the above bare statements. Further research supports the concept that the Kirklees gravestone is a hoax perpetuated from a single conflation of the ballad name 'Kyrkely' and real place-name, Kirklees. Later imitative ballads and folktales added to this single error and compounded it until this original speculation has become considered to be 'fact'. 1. Hunter, Joseph., The Ballad Hero : Robin Hood, London, 1852. 2. Robin Hood's Garland, printed by C. Dicey, early 1700's. 5.Phillips G. and Keatman M., Robin Hood, The Man Behind the Myth, O'Mara, 1995. 6. Email communication with Barbara Green, 2001. 8.Macdonald, Micheil., The Clans of Scotland, Brian Trodd Ltd., 1991. 10. From a letter to local newspaper by E.R. Short of Brighouse. 11. Major [Mair], John., History of Greater Britain, 1521. 14 Hopkirk, Huddersfield: Its History and Natural History. 15. Sloane Manuscript about 1600. 19. The Diary of John Swallow, by Sally Walker. 22. Nomina Villarum, p. 362. Copyright © Tim Midgley 2000, revised 31st April 2018.